Hot Lap goes on a tour of AWE Tuning in Philadelphia to explore just how Mustang exhausts are made and get some hands-on experience of the process. AWE Tuning started in 1991 in Germantown, Pennsylvania. AWE stands for Air and Water Enterprises and began as a one-bay garage. Over the years, it has become an international vendor with a long list of luxury sports cars that it works with. AWE Tuning mostly works with exhausts, intercoolers, and carbon fiber intakes. The manufacturer is using a lot of the technology it utilized in the European market, now applying it to the American market with success. In addition to recent models, AWE Tuning makes kits for older autos as well. The tour starts in the research and development department, which has six full-time employees including prototypers and mechanical engineers. This is where AWE Tuning comes up with concepts and takes them all the way to the market. It uses 3D scanners to digitally develop products. We get a preview of a carbon fiber air gate intake for the Mustang that will come to market in a few months. The air gate technology makes the product incredibly adaptable. From there, the tour takes us to the production facility. Everything begins with American-made tubing, which is cut down and bent precisely using a mandrel bending machine. From there, the materials are cleaned and hand ground. 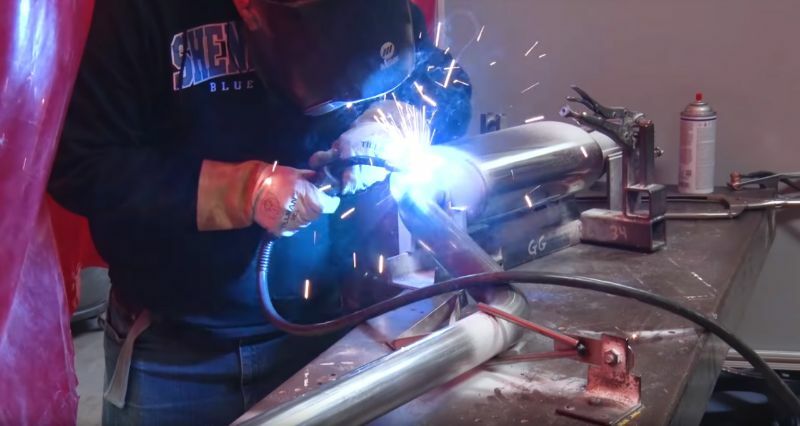 Then, the team takes care of any other needed tasks before welding. We then see the tube reduction process. The cutting cell takes care of complex cutting and utilizes AWE Tuning’s 180 technology. 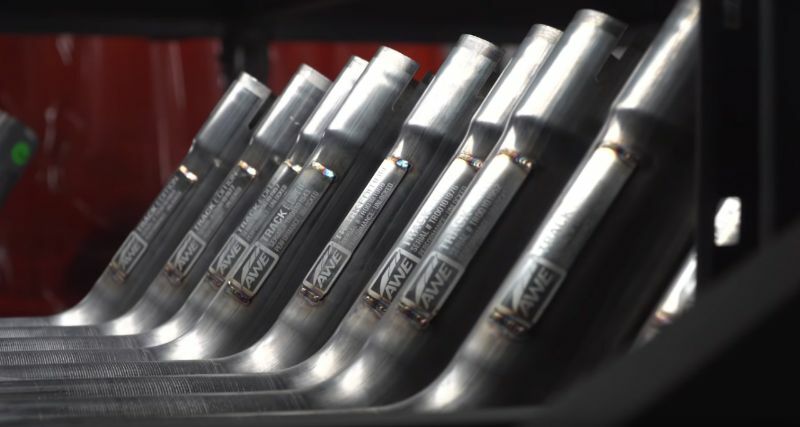 The 180 technology is what makes AWE’s mufflers different from the competition. It deploys 180 technology if it has a bad drone situation. It combines the wholes the cutting cell robot creates, the size of the canister, and some other factors to kill the drone frequency by turning it on itself. The welding area is where all the various manufactured pieces come together. There are around a dozen different welding cells. Everything is made with stainless steel, and there are both rotary welding and hand welding tools. 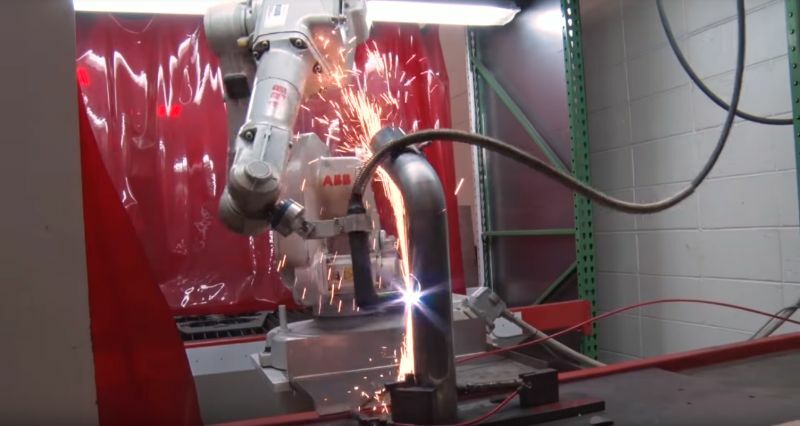 AWE Tuning is also working towards robotic welding. We even get to see some welding in action. At the end of the line, the products all go through quality control, where several groups of intakes, etc. go through every day. The quality control team ensures all the products meet the AWE Tuning’s specifications. From there, the items to go to the warehouse and then packaging and finally to the customers. We also get to see the addition of AWE Tuning components to a new 2018 Mustang. This part lets us see how the dyno works, which is a key tool for research and development. The dyno allows you to run the engine and check stats without the auto actually moving in place, showing that the AWE system definitely improved the Mustang’s performance. It is also interesting to note that any purchase of an AWE exhaust system comes with a blow pop just for an element of entertainment.